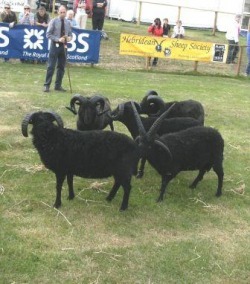 Since 2003 there have been classes for Hebridean sheep at the Royal Highland Show, and we have shown our sheep there since then up until and including 2011. 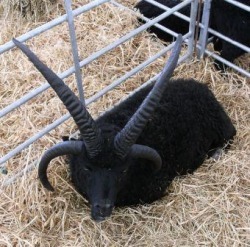 We do have reservations on the merits of showing sheep but do consider it important to show Hebridean sheep to both the general public and potential flock owners. Here are some pictures from previous shows. Gladstone Robin of Loxley in his pen. Amazingly, he loves the attention and spends his time being photographed and stroked by young ladies. Judge Donald-Alick MacLeod of South Uist looks pensive as he weighs up the merits of the senior tups. Our gimmer entries, Gladstone Scarlett O'Hara on the left and Gladstone Meg Merrilees on the right. 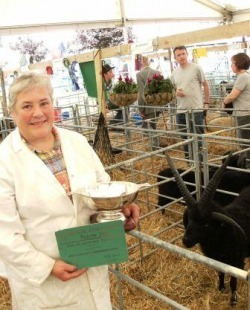 Robin looks on as Juliet poses with the Gladstone Trophy for the best 4 horned Hebridean Sheep in 2010. 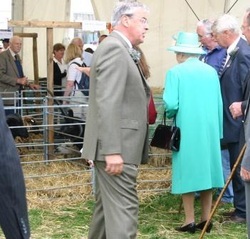 If you look closely, you will see that Gladstone Laughing Boy has captured the attention of the Queen. The distinguished gentleman at top left is the late Tom Finlay, the most noted Shetland Sheep Breeder of his generation. 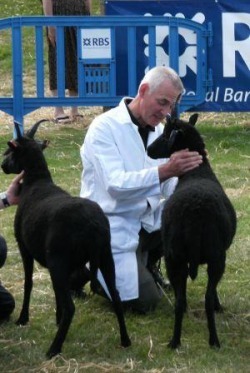 Despite his enormous collection of trophies, he gained more pleasure from introducing novices to the pleasures of owning sheep. We owe him a lot and he is sadly missed.